After a great night of rest and fantastic care by our AirBnB hosts (thanks for the homemade Christmas pudding and cream – best food I had on the whole trip!) we were ready to see more of Dublin. We woke up early and ventured out to walk the city. We were staying in the Docklands and we were headed to Kilmainham Gaol for our first stop; we saw a lot along the way! We walked by the Customs House, the River Liffey, the Famine Memorial, Trinity College, and City Hall once again, this time with brighter eyes. Dublin is such a gorgeous and historic city, as you can see in the slideshow below. Walking the city, even in cold, misty rain was well worth it to see the sites. 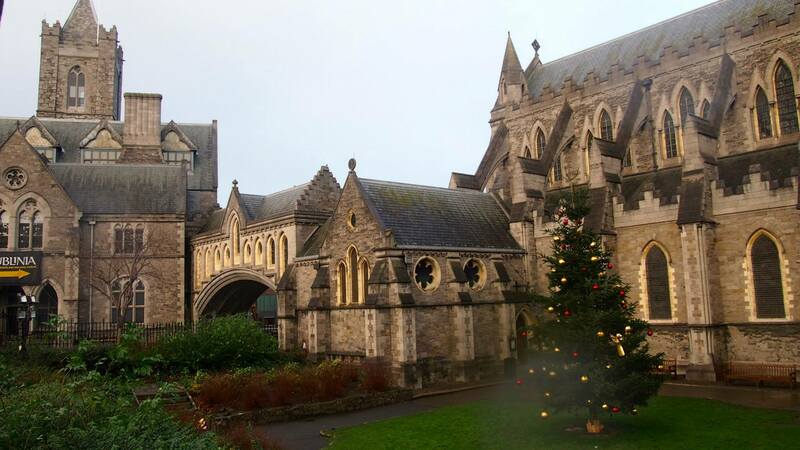 One of the most beautiful spots we saw was Christ Church Cathedral. The cathedral was originally founded around 1028, which is incredible to think about – the millennial celebration is only 14 years away! On our next trip, I MUST see the Cat and the Rat in the crypt. It was a nice stop along the walk, which turned out to be a bit further and soggier than we had originally intended. We finally came up to Kilmainham Gaol, after a false stop at a Garda station and a walk past the mental hospital. The Gaol gets it’s own post, so look for that one next. After a moving and informative visit to Kilmainham, we started back towards the City Center and the Guinness Storehouse at St. James Gate. 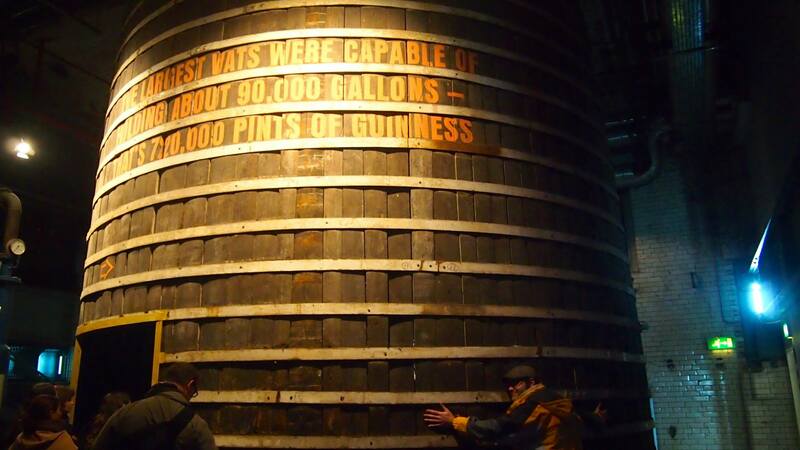 This has been the creation site of delicious malty goodness for over 250 years – and don’t worry about losing the black stuff anytime soon: some say the lease Guinness has on the site won’t run out for another 8,475 years! Arthur Guinness originally leased the site at St. James Gate for £45 per year. However good the story is, the brewery has since exceeded the original acreage, and therefore that original lease was bought out (by Guinness). The Guinness Storehouse tells the story of how beer is brewed, which may not sound like the most interesting exhibit to everyone – they did a great job with it, though! The museum, as it were, starts in a giant giftshop of everything Guinness. From there, visitors enter what is essentially a giant pint glass that serves as the entrance to the educational part of the tour. 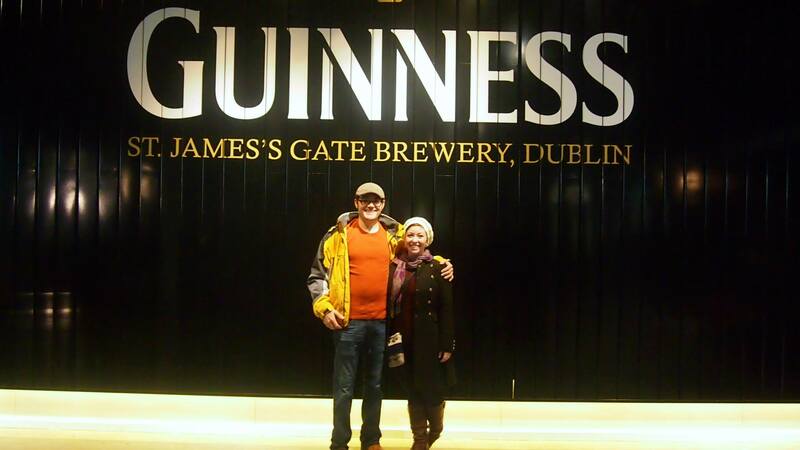 6 stories contain exhibits, cafes, and bars; as visitors ascend they learn the entire process of brewing Guinness, complete with flowing waterfalls, fields of hops and barley, and giant barrels and casks. The social story of the drink and advertising is also worked into the the exhibit, complete with plenty of photo ops. The only downside to the exhibit, for me, was that everything was (very well done!) audio and visual effects rather than the actual brewery. I understand the reasons for this, with a ton of visitors, some who might get unruly and fall into a giant vat of mash, but it still seemed somewhat disingenuous. 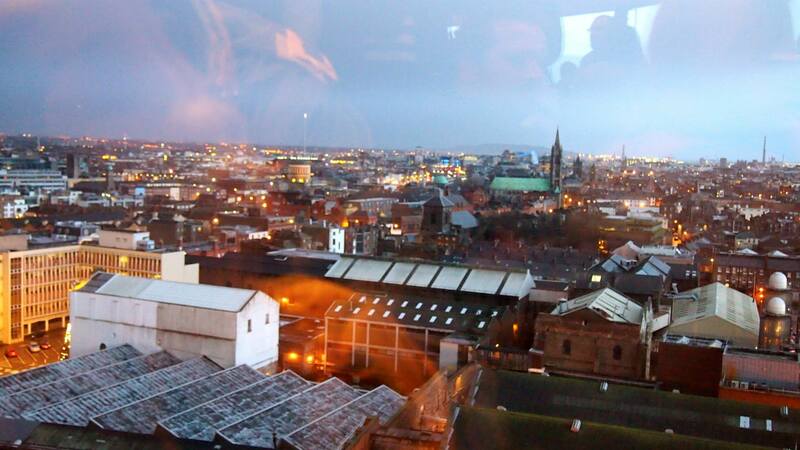 One of the best attractions (other than the honeyed muesli pot from the cafe that really hit the spot when I was starving after a cold walk all across Dublin) was the Gravity Bar on the top floor. The bar offers, aside from perfectly pulled pint of Guinness, a 360 degree view of Dublin; from there you can see the mountains, the River Liffey, the growth of this fantastic city, and on a good day, even out to the busy port. It was great to sit back, look out over this city that felt like a home away from home, and sip on a pint (included in the ticket price). We soon headed back in the cold, back past Christ Church Cathedral, and to a pub for a bite to eat. Then we called it a night to get ready for a VERY early morning; we had an 5:30am bus to catch to Northern Ireland, our first foray into the United Kingdom!